Arena Screen has printed t-shirts and polo shirts in Exeter since 1989. Call us for help and pricing on 01392 364407, or send us a message. We can supply t-shirts of any size for screen printing, embroidery or thermal transfer, with a variety of t-shirt styles for men, women and children, from XS to 4XL. 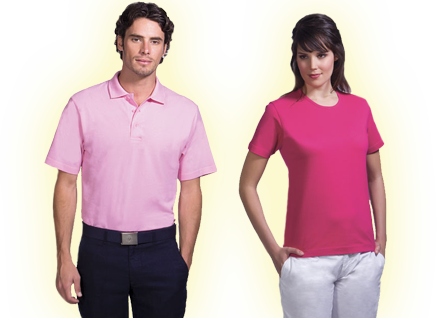 Browse our clothing catalogue. We specialise in small to medium print runs and start offering wholesale discounts from orders of just 10 shirts. Screen printing is a long lasting solution for tshirts, polo shirts, hoodies and a whole variety of clothing. Choose from 1-10 colours. See our full catalogue of clothes for printing. Fast, full colour thermal transfers allow you to personalise team shirts (with names and numbers, for example). Our transfers are really hard wearing so your polo or printed tee shirt will look better for longer. We can print photos, designs and images on many types of clothing. For advice, call us on 01392 364407 or send us a message. We offer local delivery in Exeter. For orders in the rest of Devon and nationally, we send your orders by overnight courier. Need something printed fast? No problem. Give us a call on 01392 364407 and we'll do our best to help you. "Thank you so much. They were perfect. I would like some more like the last batch please."